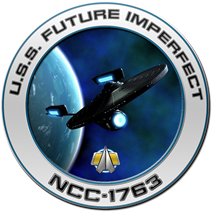 In this edition of Future Imperfect, Mike and Steve sit down and discuss The Star Trek Gaming World. We cover the games of consoles, PC, Mac, CCG, Table Top and more! “LCARS” this week features a brief history on Steve’s intro to Trek Games with his first PC game. “From the Replicator” is OFFLINE this week but will be back soon. So sit back, relax and listen to the guys talk the games you may or may not have been aware of. ENGAGE and Live Long and Prosper!